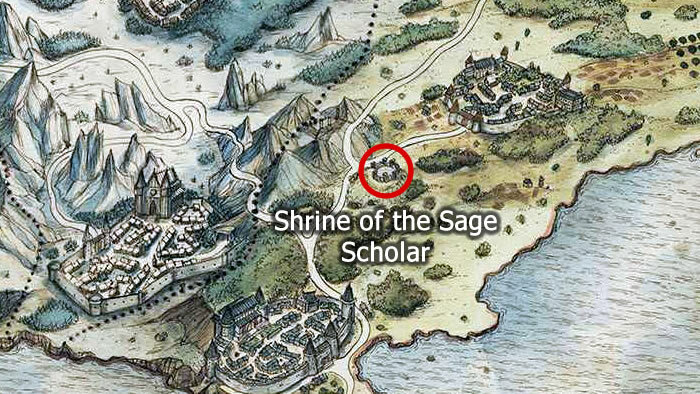 Find the Shrine of the Sage location in Octopath Traveler to gain access to the Scholar secondary job class. The latest Square Enix release Octopath Traveler is a game that allows players to choose their own path to adventure. As such, it also allows players to fully customize each of the game's eight different heroes, a process that involves not only learning various skills, but equipping different secondary jobs. Of course, before players can equip secondary jobs, they'll have to find each job's specific shrine. Keep reading to learn how to find the Shrine of the Sage in Octopath Traveler in order to unlock the Scholar secondary job class. The Shrine of the Sage in Octopath Traveler can be located just off a main path. Starting from the entrance to the town of Noblecourt, follow the path west past the man and the tent, then turn due south and walk into the grass. Keep walking southward until spotting a little boy, then turn slightly east to walk down a path between short cliffs — players should be able to spot a nearby treasure chest if they're heading the right direction. Continue through the grass further east until the cave entrance can be spotted, then head inside. Once arrived, continue down the passage toward the east, turn north to climb the stairs, and approach the altar. Press the A button to have the party hear the disembodied voice of Alephan, the Scholarking, who is happy to learn that the heroes have made it to the shrine. As a reward for their bold efforts, Alephan will then unlock the Scholar secondary job class, giving each of the game's eight heroes access to the elemental skills and potent attribute bonuses associated with the class. Seven other shrines remain for player who wish to unlock every single core secondary job class in Octopath Traveler. To learn where each of these shrines can be found, be sure to stop by our guide to all shrine locations in Octopath Traveler. Beyond that, players are welcome to check out Shacknews' Octopath Traveler strategy and guide hub, which is packed to the brim with details concerning job attribute bonuses, active and passive skills, boss strategies, and miscellaneous trivia.